The NEW PHILOSOPHY that CLEARS THE WAY for everyone to "get over it" and "get on with it"! "A simple, practical blueprint for outstanding perform- ance." "We implemented your philosophy and achieved a 30% increase in sales." -Kenneth J. Burgess Jr., Pres, Morgan Hill, Inc.
"An excellent success tool. . . full of gems that work for families and business." "No Excuse!" will truly reinvent our organizations and allow society to evolve to its next level of greatness." -"Chic" Thompson, Author of What A Great Idea! Schedule Jay for your next meeting or professional & personal development training session. His dynamic presentation will touch your peoples' hearts & stir them into action! Increase sales, registering/sponsoring, and improve profitability. Upgrade relationship-selling skills to excel over the competition. Instill integrity and accountability to enhance loyalty and trust. A MUST READ for everyone who wants growth & success! 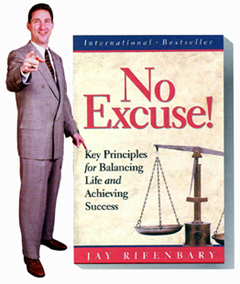 Jay is a speaker, consultant, trainer, and founder of Rifenbary Training & Development Center. He's a West Point grad and was an Airborne/Ranger and Commander, and multimillion dollar sales producer. He provides results-oriented dynamic presentations on success, motivation, leadership, communication, team building, and family and interpersonal relationships.